Some of the most attractive bicycles in the mid-to-late 1970s were built by Motobecane. They always had great paint jobs, including the model and make designations printed on the top and down tubes. That’s right: when you saw the words Grand Touring and Motobecane, you saw paint, not decals. A good bicycle looked good. A deep, glossy finish did more than protect against rust. It projected pride in French manufacturing. That was important to me back then. I had two Motobecanes from that period: a Team Champion and a Grand Touring that looked similar to this one photographed at Sunday’s Udder Century in Union, Illinois. 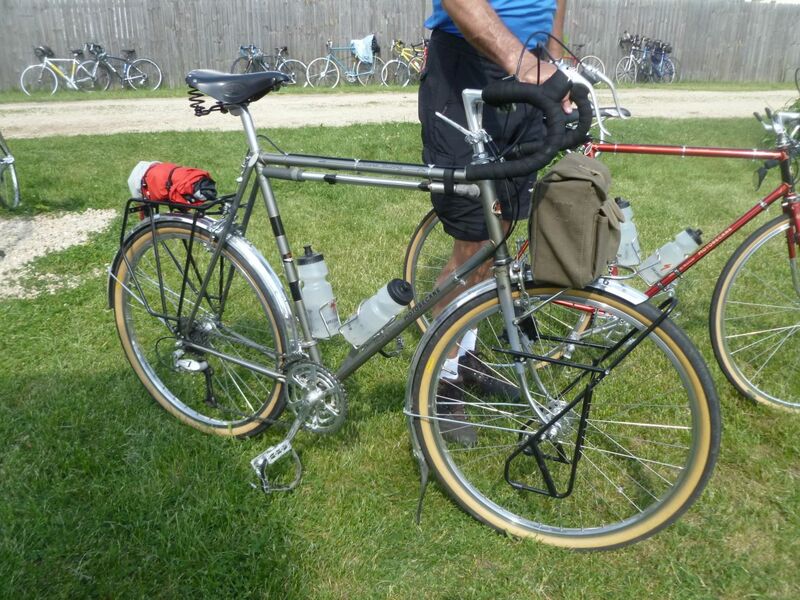 I say similar because the owner of this eBay-purchased Grand Touring modified it for 650B x 42 tires, making it a better match for the gravel roads he enjoys (though Udder Century riders always travel on pavement). According to a 1977 Motobecane catalog, the bicycle originally sported a larger-diameter 27-inch rim with lower-profile 1-1/4-inch tires (approximately 32 mm wide). Bicycle Quarterly editor Jan Heine, who says he prefers “42 mm tires for the added comfort and safety they provide,” illustrates the huge difference in air volume between skinny and wide tires here. Suffice it to say that this owner got a lot more cushioning air without adding much weight. As Rivendell founder Grant Peterson says, “Air is light, free, and wonderful.” Light and wonderful, true. But not free. Not when you’re converting a 37-year-old bicycle from one size wheel to another. Two racks are attached to the forks. The top rack bolts to braze-ons just below the centerpull brakes, which are longer than the originals. 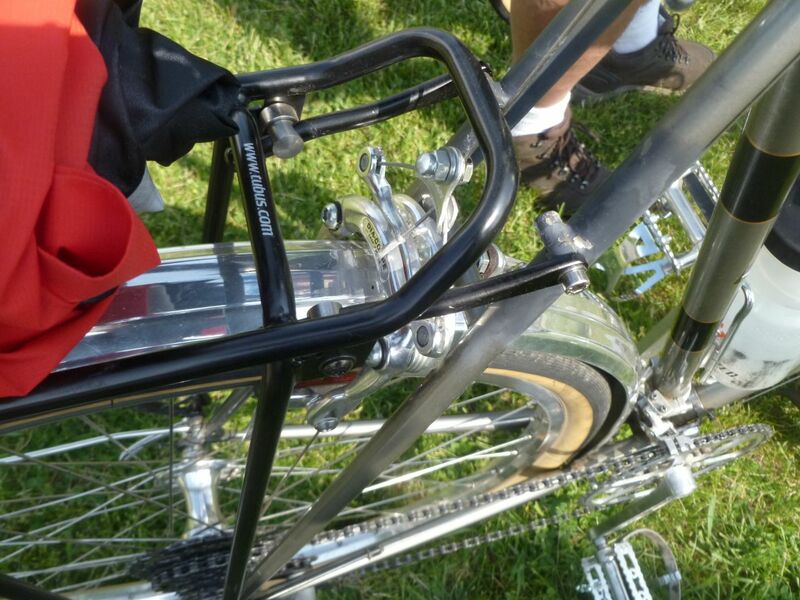 And if you look just slightly down and to the right, you’ll see one of the braze-ons for the lowrider rack. Because of the torchwork, the champagne finish suffered. But the replacement gray primer around the braze-ons isn’t as jarring as you’d think. Maybe it’s the 650B wheels, maybe the racks, but I didn’t even notice the altered frame until I got home and reviewed the pictures. More proof that I don’t pay as much attention to paint–even really good, really glossy French paint–as I used to. 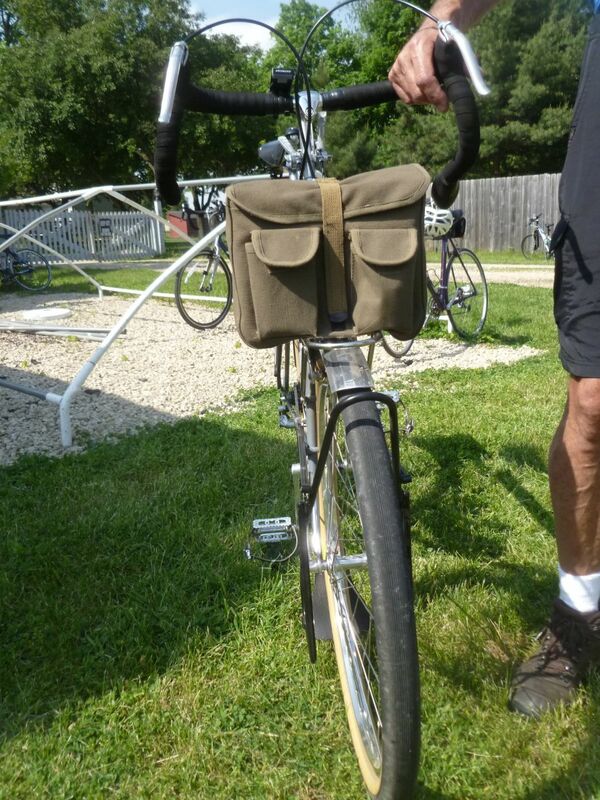 This entry was posted in Equipment, Other bicycles, Report from the road and tagged 650B tires, braze-ons, Grand Touring, Motobecane, toe strap, Udder Century. Bookmark the permalink. That looks to have been a really neat project. I haven’t yet drank the Kool-Aid when it comes to 650B – but count me as intrigued by pretty much everything I’ve read. What’s interesting to me about the bike you write about is the size: It’s a nice, tall frame, and similar to what I ride. This interests me because I’m curious whether taller frames might handle differently or be unwieldy on the slightly smaller wheel. I figure probably not – but it’s a lot of time and scratch to invest only to discover after the fact that taller frames match up better with 700c (or even 27 inch!) wheels. Aside from the magic carpet quality of the tires themselves, did the owner offer any insights about the ride characteristics? I only had a moment with the owner, and he focused more on the suitability for gravel roads than on overall comfort. In that environment, I think you’d have to give the handling edge to the wider tire. On a smoothly paved road? Whatever the effect, it might be due more to the air volume of the tire than the exact diameter of the wheel. In any case, he seemed very happy with the bike. Which is a good thing, given, as you noted, the expense. What fenders are those and how wide? Was any modification done with the front fork to make those enders work? Sorry, this was a quick interview while the gentleman was wheeling back to the road. 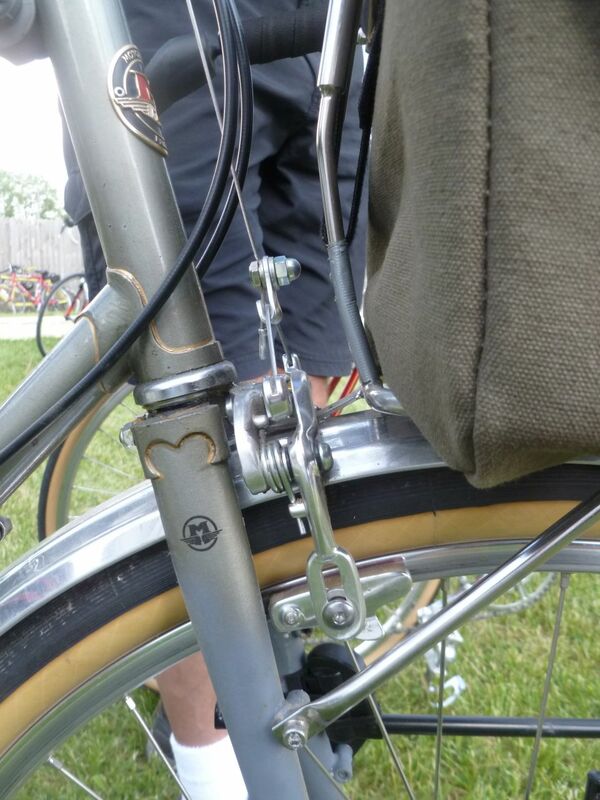 I’d guess the flat fork crown would allow as wide a set of fenders as any.